WeChat has released a new feature for its mini programs—bidding for ad space in the “Mini Programs Nearby” list (in Chinese). Now open for internal testing, the function is still in closed beta and is only available through a mini program interface, not on the WeChat social advertising platform Guangdiantong. When a user opens the “Mini Programs Nearby” list, they are served mini programs based on their location and other metrics, including age gender and operating system. With this new feature, advertisers can bid on ad space on this list. Tencent has embarked on monetizing WeChat’s 963 million user base since August 2016 by launching WeChat “Moment Ads”, which is Tencent’s biggest attempt to achieve monetization yet. This attempt proved quite successful over one year after its launch. According to Tencent earnings report on Q2 2017, online advertising revenue rose 55 percent to 10.15 billion RMB, helped by a 61 percent rise in “social and others advertising” revenue, mainly from WeChat advertisements. Tencent officially released its WeChat mini program this year on the 9th of January. When the idea of WeChat mini program was initially introduced to the public, it was expected to replace mobile apps, but it turned out that WeChat mini program failed to reach user’s expectations. 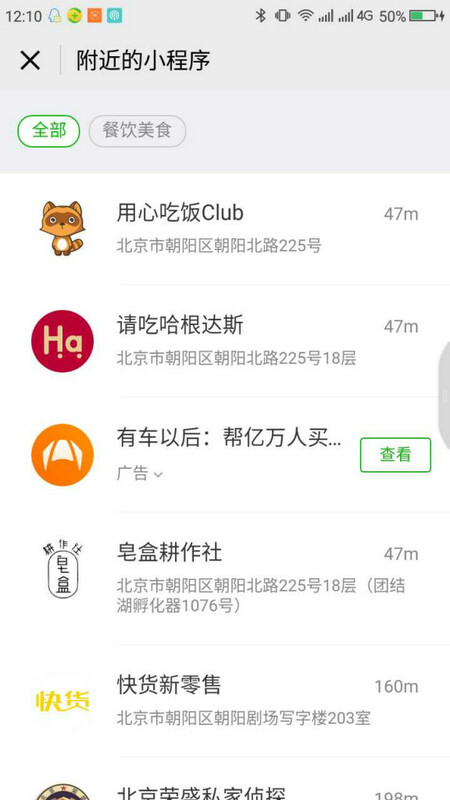 On June this year, WeChat made mini program discoverable by searching keywords.